Hello Friends! I’m so happy you stopped by! This week I’m sharing three ways to use the Caffeinated Sentiments set. I had an obvious lightbulb moment when I realized this set was not just for coffee themed cards but also everyday occasion cards. Yep, I actually did a happy dance when I figured this out and I thought it would be fun to share a few ideas with you. At the end of the post I also included a starter list of sentiments you can build from this set! I stamped all the cards with a rainbow of VersaFine Clair Inks. 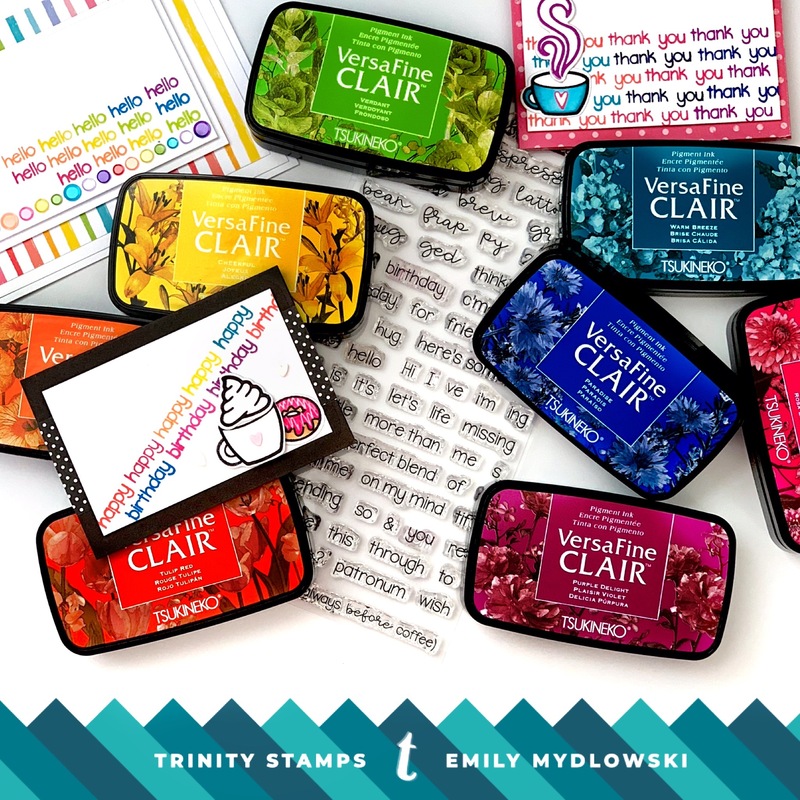 The VersaFine Clair ink colors are vibrant and the stamped impressions are always crips and clean and you can grab all the colors in the Trinity Stamps store! I also included some sneak peeks of new release embellishments. Using a T-ruler I made three pencil lines across the card. Just don’t forget to erase your pencil lines after stamping! I stamped the first hello image in Tulip Red on the first line and then stamped the second and third line one “hello” over from the previous line. I stamped hello with the remaining colors (Summertime, Cheerful & Paradise) until I reached Purple Delight and ran out of whitespace. Then I arranged circle embellishments (sneak peek) into a rainbow pattern and adhered them with Nuvo Deluxe Adhesive. To finish the card, I stacked the panel with white card stock frames and rainbow patterned paper. For the next two projects, I thought it would be fun to create gift card holders to add to my stash. Having these on hand is a great reason to share little everyday happiness with friends, co-workers, family, etc. I trimmed a piece of patterned paper at 8.25 x 3 inches. Then I scored the patterned paper at 4 inches and folded in half lengthwise. This left about 1/4 inch from the fold which I scored and folded to create a flap enclosure (see photo below). When folded the final size of the gift card holder is 4 x 3 inches and you can use a glue dot to close the flap enclosure. Using a T-ruler to create five straight pencil lines across the card. Then I stamped Thank You from edge to edge using reds, purples & blue VersaFine Clair Inks. With a few die cuts in my stash from the Coffee with Character set, I did some copic coloring and adhered the die cuts to the white card panel. To add some dimension, I adhered the card panel to the gift card holder with 3D foam adhesive. Using a die I had in my stash, I cut the gift card holder in black card stock. I used a T-ruler to create two angled straight pencil lines across the white card stock panel. Using a Rainbow of Versafine Clair Inks, I stamped “happy” on one line and “birthday” on the second line. I used more of the die cuts I had in my stash from the Coffee with Character set and adhered them to the card panel. For pop, I added heart-shaped embellishments (new release sneak peek) and small white star embellishments. I stacked b/w polka dot patterned paper to the front of the gift card holder and adhered the happy birthday panel with 3D foam adhesive. So there you have it friends, three ways to use the Caffeinated Sentiments stamp set! If you don’t have this sentiment stamp in your collection, it is a great Trinity Stamps starter set. Bonus, I hear that the font used in this set also matches the fonts used in some upcoming new release sets…so even more sentiment combinations will be possible. Speaking of bonus, I didn’t forget the starter set of sentiments for this set. Enjoy! Wishing you a happy brewday/birthday, Happy brewday/birthday to you, Have a Frappy Birthday, Happy Birthday, Friend! I hope you enjoyed this post and can’t wait to share with you next week. Until then, you can catch me on Instagram @popsofpaper or on my blog: www.popsofpaper.blogspot.com. 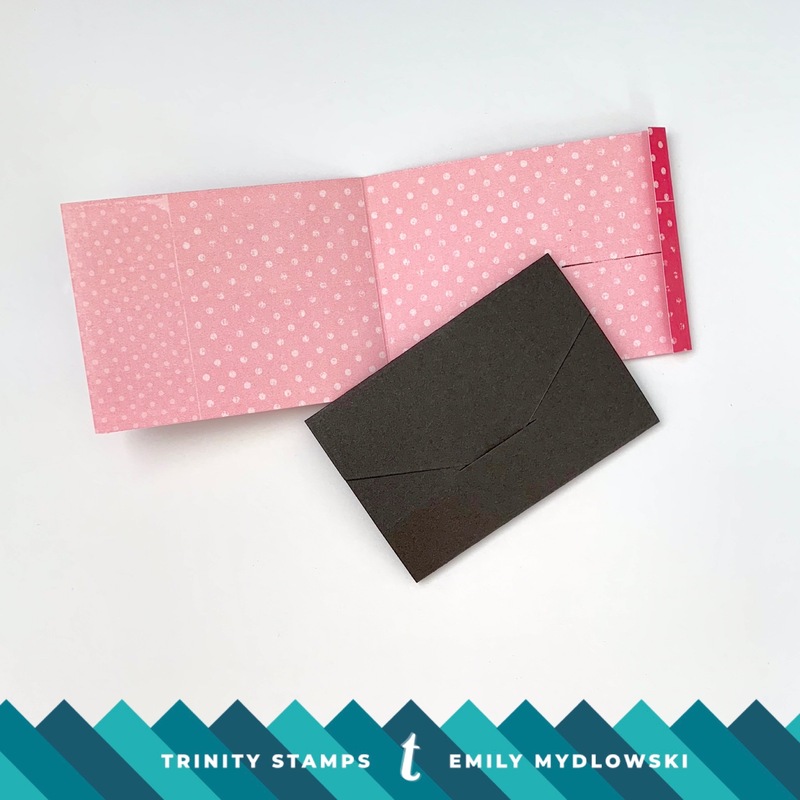 Don’t forget to stop by all week at the Trinity Stamps Blog, You Tube channel and Instagram for more inspiration and Winter Release Sneak Peeks (November 2nd is the big day) from the talented Trinity Stamps design team!